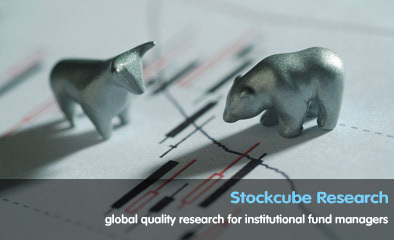 Stockcube Research has a global reach, supplying high quality research to institutional fund managers on five continents from offices in London and New York. Our unique, custom portfolio and watch-list analysis ensure that we provide relevant research, tailored exactly to the individual manager's requirements. Stockcube Research has been serving fund managers, investment banks and hedge fund managers since 1989 and we are the largest technical research firm in Europe. Our analysis produces alpha-generating ideas at the stock, sector and index levels. Our ability to contrast equities with their peers, combined with the scale of our coverage leads to an enormously powerful 'lateral vision'. We deliver our research in an uncomplicated style to make our communication as time efficient as possible. © Stockcube Research Ltd, 2019. Stockcube Research is a wholly-owned subsidiary of Stockcube Plc. Use subject to our Terms of Business and Risk Warning. Stockcube Research Ltd is authorised and regulated by the Financial Conduct Authority.